An 85-year-old British sailor who dreamed of crossing the Atlantic on a raft as a young boy completed the journey Wednesday with three friends. 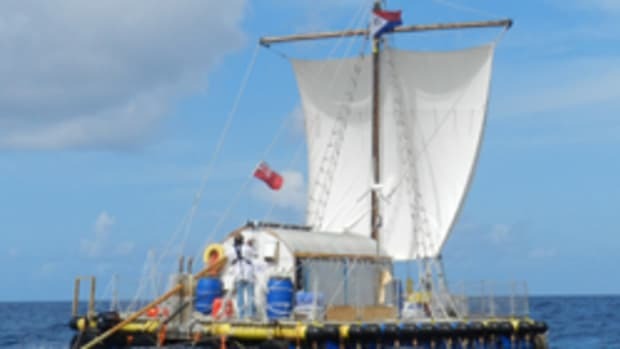 The crossing to the Caribbean island of St. Maarten, led by Anthony Smith of London, took about two months and was generally smooth except for damage to two rudders on the 40-foot, sail-powered raft. "Some people say it was mad," he told The Associated Press when he arrived in St. Maarten. "But it wasn&apos;t mad. What else do you do when you get on in years?" The jovial crew said they wanted to raise awareness about the environment and to prove the elderly are capable of embarking on adventures that are mistakenly considered dangerous. Click here for the full report with a slideshow of the intrepid quartet of aging adventurers. Click here to visit the group&apos;s website.